Specialty carts for kids and the young at heart make a trip to the store an eagerly awaited treat. What better way to promote return trips. But they can create a problem as to just How To Parallel Park a Shopping Cart? 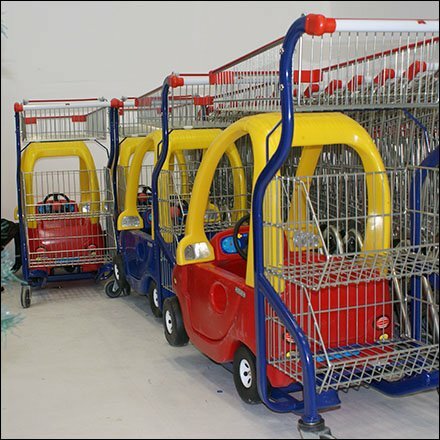 Here kids carts create their own HOV parking lane. Luckily access to regular carts is unimpeded from the rear of their separate lines. Specialty carts are not rare, but the cart parking and handling mostly undocumented. FixturesCloseUp hereby vows to pay more attention How To Parallel Park a Shopping Cart as part of overall Cart amenity reporting. Stay tuned.